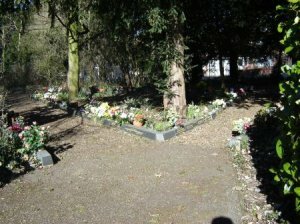 The Parish Council owns and maintains the Cemetery situated on Greengate Lane in Birstall. Dogs are allowed into the Cemetery, but there is a Public Spaces Protection Order in place which requires all dogs to be kept on leads at all times and owners must pick up after their dogs and place the waste in the bins provided. To read the full document please click Here. 3) The Haven - this is for the interment of Ash Caskets. 4) The Yew Haven - this is for the interment of Ash Caskets. only service offered to non-residents of Birstall. If you would like to discuss the above options, availability and criteria, please contact the Council Office. Summer Opening: The gates are unlocked at 8.00 am and locked at 9.00 pm. Winter Opening: The gates are unlocked at 8.00 am and locked at dusk. Interment of Coffin (for the right to inter a body in a grave or vault in respect of which the Exclusive Right of Burial has been granted - including digging costs)- of the body of a child whose age at the time of death exceeded 2 years but did not exceed 12 years. Interment of Coffin (for the right to inter a body in a grave or vault in respect of which the Exclusive Right of Burial has been granted - including digging costs)- of the body of a person whose age at the time of death exceeded 12 years. American Style or large casket /coffin. All fees are trebled for out of parish interments. Interment of Birstall residents only will be accepted, or ex-residents who moved away within 7 years at the time of death whereby single fees will apply. Interment of ex-residents who moved away between 7 and 15 years prior to the date of death will be accepted but treble fees will be applied. 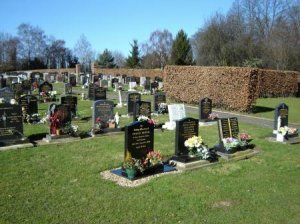 Interment of ex-residents who have not lived in Birstall within 15 years at the time of death will not be accepted for new grave spaces but can go into an existing family grave and treble fees will apply. Proof must be given of any person not living in Birstall at the date of death that he/she resided in the Parish within the previous 15 years before interment is accepted. A grave space is for the interment of coffins. Ash Caskets or cremated remains will only be accepted if a coffin has already been interred. Eco/Cardboard Coffins – will only be accepted if the grave is dug an extra one foot to allow for the insertion of board between two coffins. The cost of the extra digging and board to be met by the families concerned. If families are not prepared to meet the extra costs involved, then the Council will refuse to accept burial in an Eco/Cardboard coffin. American style Casket fees apply to cardboard coffins plus cost of board and extra digging. All grave spaces will eventually be turfed over by the Council but bulbs etc. may be planted under the turf, however, these may be cut down during the mowing season. The same criteria as above applies to reserving a grave space. The Council retains the right to refuse to accept cremated remains in the grave space if it does not comply with the ruling and will cancel reservations of the grave space if the intention is to inter ashes only. If such a situation arises, any fees already paid will not be refunded. 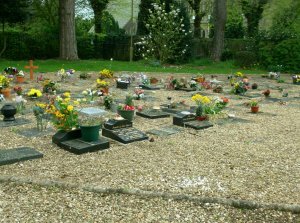 Any grave space reserved remains the property of the Parish Council until such time as they are used for the interment of coffins. As Casket interments are not permitted, cremated remains are interred directly into the earth. the black Kerbstone edgings must be purchased from W W Busby Ltd, their contact details are available from the office. A blank kerbstone must be put in place on a reserved plot. Flowers may only be placed in the integral containers within the kerbstones. Bushes, shrubs and roses cannot be planted behind the kerbstones, although woodland bulbs and flowers may be planted up to one metre behind the kerbstones. This is a newly created area where cremated remains may be interred in Caskets. A particular sized cremation tablet is to be installed on the allocated plot. The cremation tablet may be purchased from a stonemason of your choice, please see dimensions and guidelines below. Each plot is a double plot and can be used for two interments. the Parish Council realise that the stonemason may take some time to install the cremation tablet, it has therefore been agreed that you may still inter an ash casket before the stonemason has completed his work, upon receipt of a proof of purchase from the Stonemason before the date of the interment. The cremation memorial tablet cannot exceed 600mm x 600mm x 100mm (MAX). There is a slab already in place on the plot for the stonemason to fix the cremation tablet to. Flowers may only be placed in the integral vases on the cremation tablet or laid flat on the stone; any other vases or monuments are not allowed and will be removed by the Sexton. Bushes, shrubs and plants cannot be planted in this area. 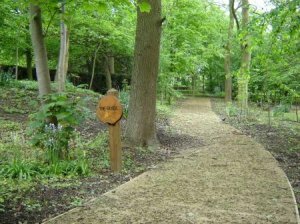 The Glade is a quiet and peaceful woodland area which is set aside purely for the scattering of ashes for both residents and non residents of Birstall. Caskets are not acceptable, cremated remains are scattered directly onto the earth. It is permissible for the ashes of residents and non-residents of Birstall, however, the fees are trebled for non-residents (those who have lived out of the area for over 7 years) no ornaments, memorial's, wall plaques or vases are permitted in The Glade. all items left in this area will be removed by the sexton. A Flat stone not exceeding 7'6" x 3'6"
Any other monument not exceeding 2'9" in height and occupying a space not exceeding 7'6" x 3'6"